If you’re roaming the aisles of a Hungarian grocery store in search of one of the country’s most popular chocolate bars, look no further than the refrigerated dairy section. With more than one million fans on Facebook for one brand’s version alone, the snack known as Túró Rudi is a curd-filled force in Hungary. Túró translates to “cottage cheese,” but the term misleads those who expect curds sitting in tangy whey water. The Hungarian rendition is more similar to quark or fromage blanc, a style of fresh, creamy cheese. Locals make this essential ingredient from fresh milk or buttermilk. Túró Rudi began as a homemade sweet produced on family farms throughout the countryside. Women crafted logs of fresh túró from their cows’ milk, then smothered them in chocolate. 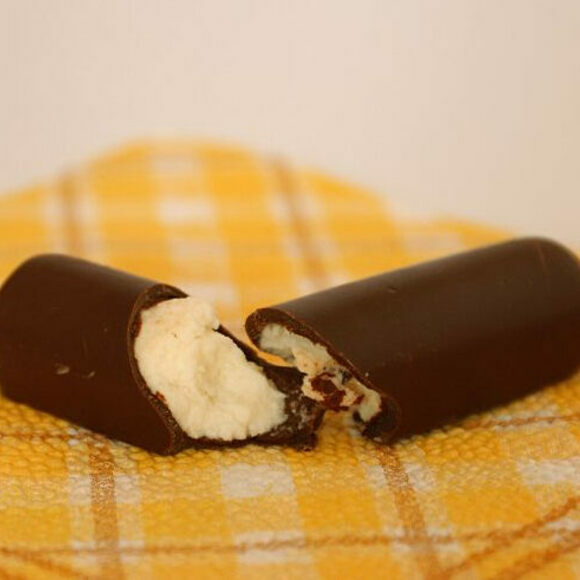 The modern, packaged iteration still coats the treat in chocolate, but uses a sweetened dairy curd stick (which resembles cheesecake). The cheesy treat now comes in various flavors, including strawberry, coconut, and apricot. Over the last 50 years, Túró Rudi has undergone a variety of ingredient and design changes. Various companies produce the bar, but the most easily recognized rendition comes in a wrapper branded with iconic red dots, made by Pöttyös (“with polka dots”). Túró Rudi is sold in just about every grocery store in Hungary. Look for it in the dairy aisle. This supermarket typically carries túró rudi.